Please pray immediately for our brothers and sisters in Sierra Leone. The BBC News reported this morning that “More than 300 people have been killed in mudslides and flooding near Sierra Leone’s capital, Freetown.” A hillside in the Regent area collapsed early on Monday following heavy rains, leaving many houses covered in mud. A BBC reporter at the scene said many people may have been asleep when the mudslide occurred. 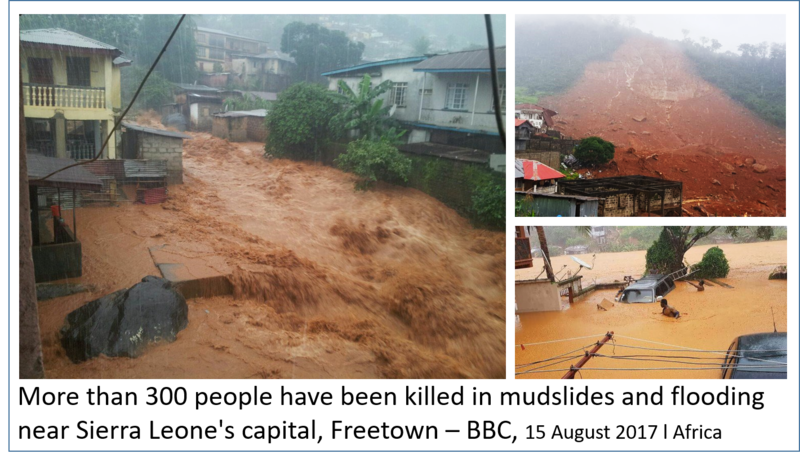 There is an SDB Conference in Sierra Leone and there are SDBs in Freetown where this devastation occurred. Francis Mattia, leader of the Sierra Leone Conference of SDB Churches reported through an email that Brother Roland Fox and 35 of their members lost their lives as heavy rains caused great mudslides (early morning Monday, yesterday). Pastor Mattia said they have been in a state of confusion and need our prayers. We pray for all who are affected in Sierra Leone. Especially, that God’s will be gracious to our brothers and sisters, and that they will find refuge and comfort in Him.